Listed below are the names of the Alfords for which we have posted their birth record. Barbara Ann "Bobbie" Alford, b. Oct 2 1943 in Greenville, Washington Co., MS to Tharon Eugene Alford and Evelyn Lorene Hunt. Bobbie, AAFA member 0044, was present at the 1997 AAFA meeting in Califonia having recently retired as a PhD working for the government. She died the following February while visiting in Africa. Document supplied by Bobbie. 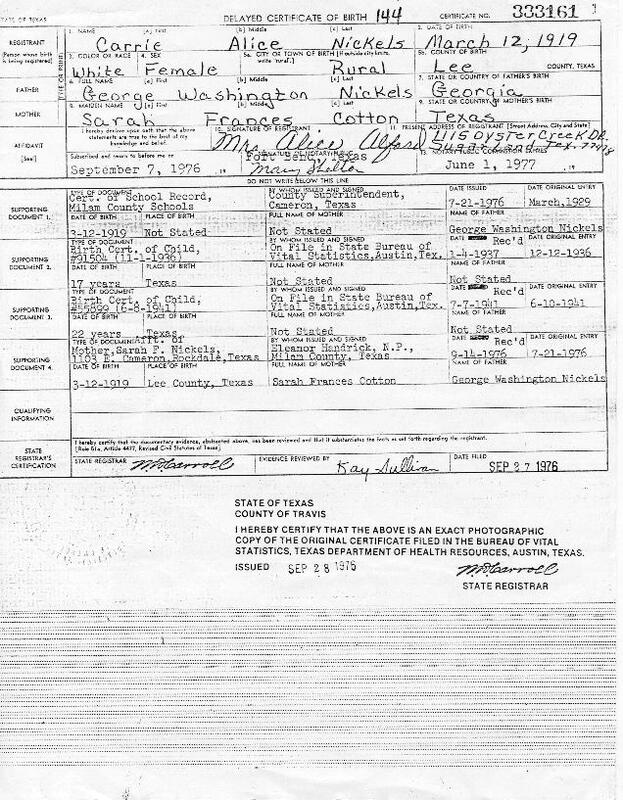 Clarence Ewin Alford, b. Apr 25 1912 in Rocldale, Milam Co., TX to Thomas Ewin Alford and Carolina Rose, and his wife Carrie Alice Nickels b. Mar 12 1919 in Rural Lee Co. TX to George W. Nickels and Sarah F. Cotton.Documents supplied by AAFA #0192 Rose Alford Shelton, his daughter.